Wash beets, trim ends and slice in half. Bring to a boil then simmer covered for about 30 minutes until tender (use fork to check tenderness, should be able to glide in and out of cooked beet easily). 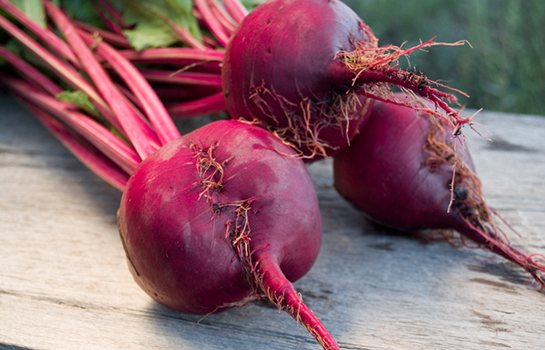 Drain beets (or retain water and use to make "pink pasta") and let cool. While cooling, prepare dressing by whisking all ingredients together in a small bowl. Peel skin from beets, then chop into bite-sized pieces. Serve alone or atop the baby romaine with goat cheese sprinkled on top.